The female elephant calf born on October 2 is named "Jazmine" ("Jazzy" for short). Facebook fans and Zoo visitors cast their votes with more than 500 votes in favor of "Jazmine." In-person votes at the Zoo&apos;s Cottonwood Café raised more than $200 that will go towards the BioPark&apos;s elephant program. "The winning name, Jazmine, carries on the flower tradition," said Rhonda Saiers, elephant manager. "She is an Asian elephant calf with a mother named Rozie and older sister named Daizy, so naming her after jasmine, a vining flower from Asia, is fitting." Jazmine is thriving with her family and learning how to use her trunk by picking up browse and trying to get it to her mouth. Zoo guests can see her for at least a few hours each day. The schedule varies depending on weather and the needs of the herd. Guests can find the daily schedule by checking www.abqbiopark.com/elephants, calling 311 or asking a Zoo cashier upon arrival. The Zoo will hold an Elephant Baby Shower for Jazmine on Saturday, November 2 at 2 p.m. Guests can enjoy games, snacks and a special presentation from elephant keepers. Shower attendees who bring a minimum $10 gift card or wrapped baby shower gift receive free entry to the Zoo that day for one adult and up to two children. 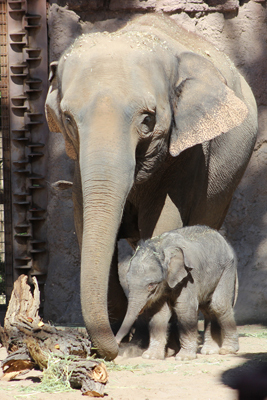 For updates, behind-the-scenes footage and background information about Jazmine, visit www.abqbiopark.com/welcome-elephant-calf.